The government says the self-purification capacity of Geum River and Yeongsan River have significantly improved after weirs set up at the rivers opened their gates. According to the Environment Ministry on Friday, since the small dams at the two rivers fully opened their gates in June 2017, the self-purification capacity of the Geum River increased up to eight times and Yeongsan River about ten times. 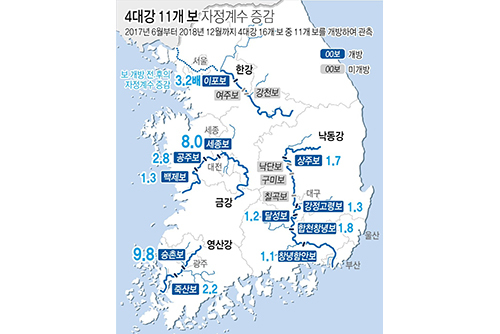 The comparable figure for the Nakdong River and Han River, which opened their weirs partially, was one-point-eight times and three-point-two times, respectively. The opening of the weirs is believed to have improved the rivers' self-purification capacity by increasing the rivers' water levels and flow speed. The water quality of the rivers also showed improvement, with a decreased incidence of algae bloom. The government built weirs on the country's four major rivers as part of the Four Major Rivers Project, a controversial river refurbishment program under the Lee Myung-bak administration. The former president who spearheaded the project claimed it would prevent flooding and droughts, but environment groups have been critical of the weirs, saying they are damaging the ecosystem of the rivers.